My co-housemate, the Pilot, offered me a fish taco and a sympathetic pat on the back when I got home from the hospital. 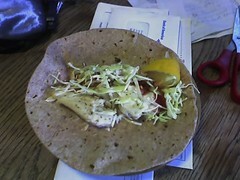 The fish was tasty, plain, room temperature; lemon from our garden, cabbage nice and fresh. Flour tacos are not my thing, the salsa was out of a safewayesque jar, and yet… it’s like the fish taco of neighborly kindness, which outweighs anything else! It was heavenly! Rook is at the hospital overnight again tonight. He’s got stamina and I don’t. Yesterday and today I had all the thoughts one would expect me to have. Feeling deeply that I wished that I could take whatever pain onto myself so that he wouldn’t have to suffer it… Mechanically forcing myself to eat things so that I won’t become useless… Hating the loud, gum-chewing, irritating people I was stuck with for hours in waiting rooms, but feeling guilty too because their kids maybe have cystic fibrosis or cancer or something seriously awful. Being afraid Moomin would die even though the hospital is great and the surgery extremely common… not just “being afraid he would die” but actually imagining it in extended detail, over and over in different ways, catching myself and telling myself to stop the nonsense, but then falling right back into it. I could imagine my stunned denial… it woudl be impossible to believe… you’d keep forgetting, a little, and then horribly remembering it was real all over again… and going over everything and blaming yourself or others… and then even more horribly, imagining years later after acceptance and grief had mixed and almost no one around you even had known him so that anyone who had would be painful to be around but also infinitely precious… You see how far my nonsense can run! Very far! Anyway of course also as I left him at the door of the operating room I thought, “Is this the last time I will see him… in this sucky way when he’s feverish and in pain…” And feeling of course that I haven’t properly appreciated every moment of my life with him before that . It was all okay and eventually a stream of handsome square-jawed handshaking ken-doll doctors trickled past me giving contradictory yet all very sensible information bits. One said he would be up and out of the hospital the next day – another said he’s be in till at least Wednesday – another said it would be 3-5 days. The words “suppurative” and “purulent” were tossed about, as well as “of course, Dr. Whatever mentioned all the scar tissue from the somethingorother.” No, actually he didn’t, the what? “Don’t worry, we removed it, and got all the pus and gangrenous tissue out too.” OH! Okay then! Naturally! I’ll just barf and faint now, thanks! I imagine that they don’t let the parents back there right away because the post-op patient is slack-jawed, drooling, zombie-eyed, maybe still intubated and covered with blood. So they clean them up before taking them into the secondary recovery room. Finally I was with Moomin, smoothing his forehead whenever he moaned and his heart rate monitor would start blipping. It was good to see the forehead smoothing’s effect on his heart rate. He knew it was me… Actually Rook is much better at consistent smoothing and soothing, and has been since Moomin was born. He’s patient and doesn’t fidget. As I said, he’s got the rough part of the shift, all night tonight. I did a good job of not fidgeting and being a beacon of radiant mom-like calm. You have to believe in your zen-like calm or it doesn’t work! Even if you’re kind of faking it, you have to believe it! Moomin didn’t have any postop nausea – in fact he ate a popsicle before he was fully conscious. That was a huge relief! That’s my side of this long day… There is so much more, of course. Moomin was incredibly brave, helpful, cooperative, and excellent. I'm sure this doesn't really mean much, coming from someone that you don't even know, but I am really glad that he's okay. He sounds like he was super brave and I will be sending good "fast recovery" thoughts his way, for whatever that's worth. Good for you, you were brave too. I'm so glad he got the help he needed! How totally frightening! I'll try to call you but I bet you'll be at the hospital. Hang in there buddy! Oh my! We are thinking of ya'll and let me know if I can do anything….I can bring you dinner, run an errand?? People will tell you that this was tougher on you. Believe them! I barely remember my appendectomy at age 9, and my mom can tell me every symtom leading up to it, the hospital stay, and the recovery period afterwards. Take care of yourself! This too shall pass. You're amazing! Rook, too. So glad your brave and daring little boy has such loving and mindful parents. He'll pull through. Sounds like he's getting better already. "the fish taco of neighborly kindness." That's funny. I see you have not lost your sense of humor. This is good. I hope Moomin is home soon and feeling back to his usual self. I do the same thing telling myself the awful stories of what could happen until I am in a state of panic and the verge of hysteria. email to my lizhenry@gmail account is better than the phone right now!Thanks guys. huge rapid improvement this afternoon so that's even more of a relief. Huge big pile of well-wishes and prayers coming from my surgery-phobic heart. Add an extra hug and kiss for me. Oh, Liz! I'm glad he came through with flying colors. I'm sending him speedy recovery vibes. You're a fantastic mama. Sorry to hear about Moomin. I hate that feeling of helplessness when you can't wave your wand and fix them. I hope everyone is feeling better today! I'm totally confused – have been gone a while and don't know what surgery was had, but wishing you the best and so sorry to hear you had to go through that. I can't imagine.